Are you looking for relaxation and closeness to nature in a dignified and modern ambience? Do you find the sound of a stream just relaxing? Are you looking forward to visiting wild ducks, cats, chickens and squirrels? Do you love art and culture? The Mozart and festival city is just a stone's throw away. Are you curious about the rich sights of Salzburg and the Salzkammergut? With us you are in the middle of it. Our holiday property with two high-quality renovated apartments is located in the nature reserve Irrsee. The house can be described as a single location, the neighbors live a few hundred meters away. Due to its free position you can enjoy the sun on nice days from morning to early evening. The house is located on a stream, by the Bach noise relaxation is inevitable. The two separately accessible, spacious apartments "Bachrauschen" (ground floor) and "Bergblick" (upper floor) each have 100 m² of living space and each have two spacious solid wood bedrooms. Each apartment has a modern and well equipped kitchen, a storage room and a bathroom and toilet. The bathroom on the ground floor also has a bathtub. In the apartment upstairs you will find a south-facing balcony. The well-kept garden with its many herbal and berry corners invite you to snack and linger. In the large orchard there are cherries, plums and apples to enjoy in late summer and autumn. In the adjacent stream you can refresh yourself on hot days. The many sitting and lying areas around the house you can unwind. Hand and bath towels and bed linen are available. The underfloor heating is heated by means of an air heat pump. We get 100% green electricity! Final cleaning: once per object costs in the amount of 50 EUR (obligatory). The house is located next to a stream that promises cooling on hot summer days. The Salzkammergut cycling and hiking trail leads past the house. The environment of the Mondseelandes delights heart and soul. 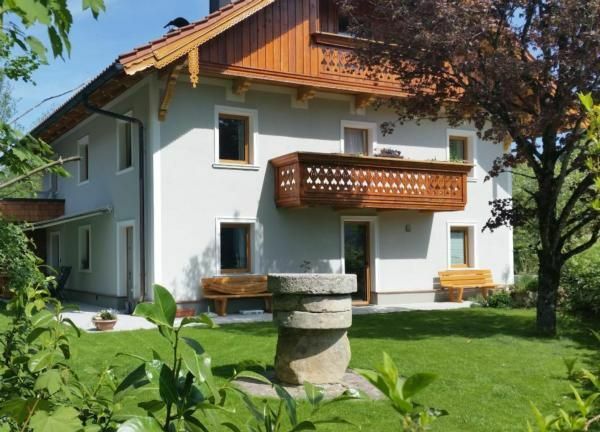 You are surrounded by green meadows, intact farmland, the mountains are within your reach and two lakes for swimming or Schifferl driving invite. The festival city of Salzburg with its large cultural offer is quickly accessible via the motorway. Gmunden, the Attersee and other Salzkammergut highlights are a stone's throw away. For the physical well-being provide some nice places in the area. Tip: Nearby there are some really great snack stations / wine taverns.